Power Text to Speech Reader is an award-winning text-to-speech player that lets you listen to documents, e-mails or web pages instead of reading on screen,it uses voice synthesis to create spoken audio from text with natural voices. You can listen on your PC or save text to MP3 or wave files for listening later. Even better, if you have a portable audio device you can take your text as MP3 files to the gym, in your car, or anyplace you need to go.It can directly open Plain Text files (.txt), Microsoft Word files (.doc), PDF files (.pdf), EMail files (.eml), Rich Text files (.rtf), HTML files. For Microsoft Internet Explorer users,Power Text to Speech Reader supplies a handy toolbar plug-in for Internet Explorer and for Microsoft Outlook supplies a handy toolbar plug-in for Outlook.Power Text to Speech Reader supports dozens of male, female and robotic voices for over 11 languages. 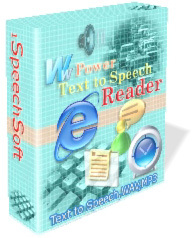 Power Text to Speech Reader can monitor the Windows Clipboard and automatically process its contents. This feature makes it easy to read web pages, e-mail messages, documents and much more. Text to speech, read aloud file list, text to mp3, batch convert text files to MP3 files. Integrate with MS Word, WordPerfect, OpenOffice, IE, Explorer. Read aloud any text. Natural voices provide you excellent voice. Learn foreign language. This site does not contain serial number, crack, keygen Power Text to Speech Reader serial number : serial number is the simplest type of crack. A serial number(cdkey,product key,etc) is register the program as you may already know. a crack or keygen may contain harmful software. If you cannot find the exact version you want, just give it a try. for more information read .nfo/.txt/.diz file include in zipped file.